Study suggests a honeybee disease might be spilling over into wild bee populations in the U.K.
Deformed wing virus (DMV), a disease that affects commercial honeybees, can also infect wild bumblebees and shorten their life span, researchers report today (February 19) in Nature. Given the overlapping geographical distribution of the disease among honeybees and bumblebees in the U.K., the authors conclude that the virus is likely spilling over from commercial hives into wild populations. Bumblebee worker foraging on a flower MATTHIAS A. FURST“The results show that managed honeybee populations, with their high density of pathogens, might pose a threat to wild pollinators,” said Elke Genersch, a researcher at the Institute for Bee Research in Hohen Neuendorf, Germany, who was not involved in the study. While the results support the idea that disease transmission from honeybees might contribute to bumblebee population declines, the study was not definitive. 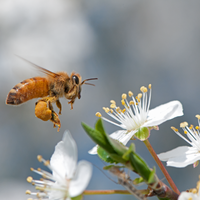 DMV is known to cause malformations in honeybees and reduce their lifespan. To measure its potential effects on wild bumblebees in the U.K., Mark Brown, an ecologist at Royal Holloway University of London, and his colleagues infected wild bumblebees, Bombus terrestris, with DMV in the laboratory. They found that the diseased bumblebees’ lifespan was reduced by six days. “To put it into context, in the field a bumblebee worker lives 21 days,” Brown said during a press conference. “For every bee that has this virus, you’re losing about a third or a quarter of all the food it would bring back to the nest to help the nest grow.” Bumblebees live in much smaller groups—tens to hundreds of individuals—compared to the 50,000-member hives of honeybees, making the loss of a single worker all the more detrimental to the nest. Previous studies had shown that bumblebees in the wild can harbor DMV. 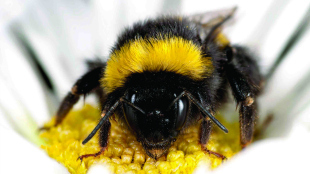 Brown’s group conducted a large survey across Great Britain and the Isle of Man to compare the prevalence of the disease in honeybees and bumblebees. Roughly one-third of the honeybees collected were infected with DMV and 11 percent of the bumblebees had DMV. Mapping out where the disease was present in each species showed an overlap in its distribution, indicating that there might be disease transmission between the two species. 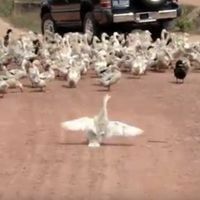 Genersch told The Scientist she was not surprised by the results. 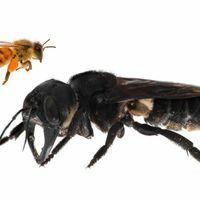 “Honeybees share the same habitat with many other pollinating insects and disease transmission between these flower-visiting insects—especially within the hymenoptera—is likely, has been discussed many times, and is not at all surprising,” she wrote in an e-mail. 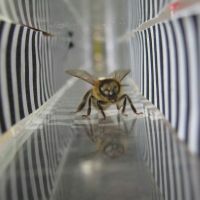 Although the study could not definitively show that DMV is transmitted from honeybees to bumblebees, the higher prevalence in honeybees “is one reason why we think the transmission is really going in this direction,” said Matthias Fürst, the lead author of the study and now a researcher at the Institute for Science and Technology in Austria. Although commercial honeybee hives can be treated for DWV with pesticides, there is no way to treat wild bumblebees “because we don't know where the nests are,” said Brown. M.A. Fürst et al., “Disease associations between honeybees and bumblebees as a threat to wild pollinators,” Nature, 506:364-66, 2014. © 1986–2019 The Scientist. All rights reserved.